Kingdom Hearts III is full of incredible worlds such as Olympus and Tangled's Kingdom of Corona. 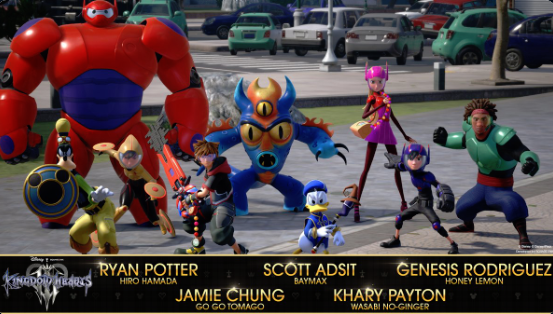 Big Hero 6 is another world confirmed for Kingdom Hearts III and Square Enix has confirmed that the voice cast for the movie and television show will reprise their roles in the upcoming game. The actors confirmed at this point are Ryan Potter as Hiro Yamada, Jamie Chung as Yo-Yo Tomago, Scott Adsit as Baymax, Genesis Rodriguez as Honey Lemon, and Khary Payton as Wasabi No-Ginger. Wasabi No-Ginger was originally portrayed by Daymon Wayans Jr. in the Big Hero 6 movie but Khary Payton took over the role in Big Hero 6: The Series. Kingdom Hearts III launches on January 25th for PS4 and Xbox One.